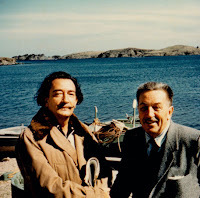 Salvador Dali and Walt Disney, 1957. Photo courtesy Walt Disney Family Museum. It was inevitable—call it destiny if you will--that the creative paths of Walt Disney and Salvador Dali would one day cross. Both men were born in the early 1900s, and although they were continents apart, they shared similar upbringings. Both had artistic ambitions, and both would eventually become the standard-bearers of their respective mediums: Walt in animation and visual storytelling, Dali in fine art and the surrealist movement. In the late 1940s, Dali would come to the Disney Studios to help craft Destino, a surreal short film intended to push the limits of animation and storytelling. It was not to be, however, What Dali called “a magical exposition of life in the labyrinth of time,” Walt called “a simple love story—boy meets girl.” It was there the two artists remained at odds. After less than a year’s work on the project, Destino was shelved. Decades later, the Walt Disney Studios would resurrect the film from more than 150 surviving story sketches by Dali and Disney artist John Hench. The resulting film would be released in 2003 to critical acclaim, winning numerous film festival awards and being nominated for an Academy Award. Ted Nicolaou is curator of the exhibition. As a filmmaker, Ted has directed a number of horror films including cult favorites Terrorvision and Subspecies. 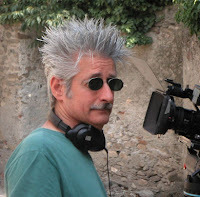 He’s also created a number of DVD and Blu-ray bonus documentaries for Walt Disney Home Entertainment, most notably Dali & Disney: A Date with Destino, which was included on the 2010 Blu-ray release of Fantasia 2000. Ted Nicolaou is my guest today in The Mouse Castle Lounge. Enjoy!